This article covers a way to add some sort of MIDI input to the Kaossilator by tricking it to read generated voltages instead of those coming from the touch pad. Please excuse any English mistakes, everything was written in a rush and not even spell-checked. The text will be reviewed and modified later to add more details and to correct eventual errors. I know the Kaossilator Pro has stock MIDI in/out capabilities, but did you see the price difference ? I guess there's no need to present the Kaossilator, if you're reading this then you probably know what it is and what it does already. Getting to the internals is very simple, it's just a matter of a taking out a few screws and an inefficient "warranty voiding" sticker. The touch pad is of a simple resistive type, which is probed at 500Hz by the Kaossilator's microcontroller. 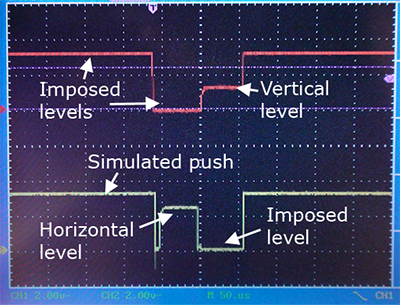 The touch position is normally read by generating a "voltage gradient" on one layer of the touch pad, and measuring the resulting voltage on the opposite one. The two layers, when in contact, act as a voltage divider. The Kaossilator seems to execute its position reading routine even if no push was detected. 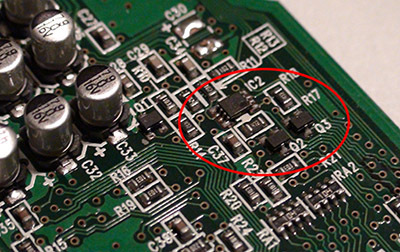 The pad has 4 connections, which I labelled according to their position on the PCB's plug. Both lines 2 and 3 are held high when the pad isn't read. This puts all of the lower layer at 3.3V. Lines 1 and 4 are set to a high-impedance state. When a read occurs, the 4th line is first checked. If the voltage on it exceeds a certain threshold, a press is registered (the voltage varies a bit with the amount of pressure). Then, the 2nd line is set to ground, putting 3.3V across the lower layer. The voltage on the 4th line is read again to get the horizontal position. Lines 2 and 3 are then set to a high-impedance state, to now use the lower layer as the probe. Line 1 is set to 3.3V and line 4 to ground. The vertical position is read on line 2. As you may have noticed, the measurable voltages always appear on two different lines at the same time (1 and 4 for horizontal, 2 and 3 for vertical), but the circuit is only able to read lines 2 and 4. Sampling doesn't seem to be made accross the entire measuring period. However, the voltage has to be stable in less than 30µs (the lines are set for 60µs). The touchpad reading circuit can be found below the LED display on the front side of the PCB. It's formed of two npn transistors connected to lines 1 and 3. This is consistent with the fact that those two lines only have to be high or floating. 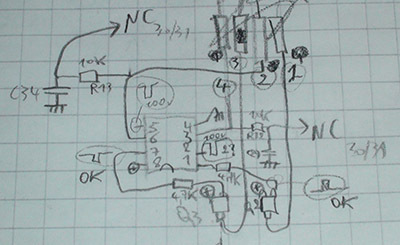 An unidentified IC seems to be housing a few more transistors for line 2 (which can be high, low, or hi-Z) and line 4 (which have to be low or hi-Z). Those two lines are also obviously connected to the Kaossilator's µC through RC low pass filters. No way to have access to anything digital regarding the touch pad from here... So analog is the only way. (unless someone finds a compatible flash µC, guesses the DSP's protocol, and writes a new firmware... Anyone up for that ?). I didn't want to use any DAC IC since they may be sometimes hard to find, and the only one I had (a MAX518) needed a 5V power supply. Given the number of possible voltages which would have to be generated and the limited space, a double 8-bit R/2R DAC didn't seem like the right solution.... The remaining choice was filtered-PWM DACs, which would only take a pair or capacitors and resistors. The main drawback of this type of DAC is the settling time. The capacitors have to be chosen to smooth out the voltage, and also allow it to settle fast enough so that the Kaossilator won't sample the voltage right in the middle of the charging curve. At 12MHz, the max PWM frequency is 12MHz/256 = ~47kHz. (The ATTiny2313 had difficulties to run at 16MHz on the Kaossilator's 3.3V supply). The ATTiny2313 microcontroller was chosen as a base for the circuit because it's cheap, has an hardware UART, two separate PWM outputs, and enough I/O pins. Because of the voltage settling time being way over 50µs, half of a CD4066 (quad analog switch) is used to gate the DACs outputs, making the Kaossilator think the voltages are coming from the touch pad. This allows the voltages to stabilize when reading doesn't take place (500Hz gives a bit less than 2ms). 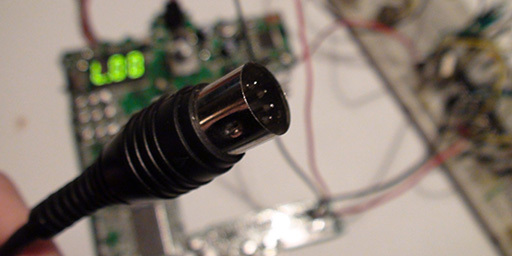 An optocoupler is used for the MIDI input as usual (current loop). Line 2 (horizontal reading) is connected to the OCRA's DAC, while line 4 (vertical reading) is connected to the OCRB one. Line 2 is also connected to the INT0 pin to trigger an interrupt when the Kaossilator initiates a read. The DACs are always on and their output is changed as soon as the right MIDI message is received. 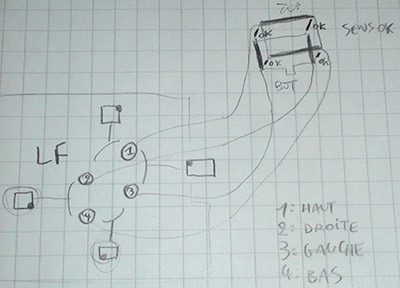 Line 4 is also connected to a pin configured as a digital high output, to simulate presses in between readings. It is set to hi-Z when reading occurs. Line 2 (red) and line 4 (yellow). The original touch pad can be left connected to "bend" the note, or to use it normally when the MIDI translator isn't on (not shown in the video). The low pulse just before the horizontal level gets out of the CD4066 on line 4 is intentional, it allows to "discharge" the touch pad (it has a rather high capacitance). It has no effect since the Kaossilator only reads the value mid-pulse. Total reading lasts about 120µs. 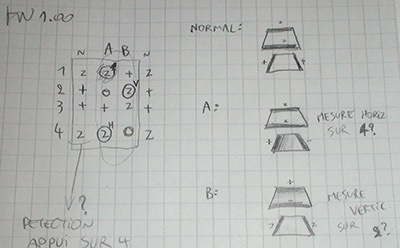 The horizontal value and vertical values are respectively picked up 30µs and 90µs after the falling edge of line 2. 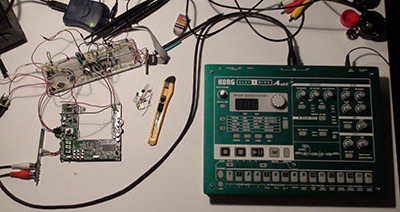 MIDI testing setup with an EA-1 as controller. A lookup table containing the right values for the PWM generators can be used to map each MIDI note to a specific voltage that has to be generated in order to produce it the Kaossilator. Since it can only reproduce 2 octaves at once (24 notes on the horizontal axis), the LUT can only be 24 bytes long. Other MIDI notes values can be wrapped or just ignored. As many audio equipment manufacturers do, Korg freely gives out the MIDI implementation of each of their devices. The one for the EA-1 is here. Download the C source for AVRStudio 4 (ugly but commented).